Dot’s Tots Foundation is a Hilliard-based 501(c)(3) not-for-profit established in 2013 to provide support to families offering foster care, children with debilitating disease, injury, and/or illness; and teenagers in their higher educational pursuits. The Foundation will host its 4th Annual Holiday Festival at the Makoy Center in Hilliard this December. Come for food, crafts, and entertainment. Leave having made a real impact on those in need. Why: To raise funds and awareness to support community youth and families. Aside from the usual fun, this year, all attendees will have an opportunity to create greeting cards for local pediatric cancer patients and foster families. A unique opportunity to spend time during the holiday season with family and make real impact for those who need it most. All funds raised will be provided to children and families in need of holiday cheer – meals, presents, and necessities. Dot’s Tots is proud to announce the second annual Harbinger for Hope restaurant tour and tasting! September 30th from 2-5pm. $50 per person. Join us for a night of fun and fundraising. A portion of each ticket purchased is tax deductible. Proceeds benefit Dot’s Tots Foundations general fund supporting area youth with debilitating disease, foster children and their families, and local teens in their higher educational pursuits. Register for the Team Skylor 5k. Race Day Registration Starts- 7:30 a.m.
5k Run/Walk – 8:30 a.m.
On February 27, 2014, Skylor was diagnosed with brain cancer and from that moment on, his motto in life was “Fear Motivates”. Fear motivates positivity – he lived each day making sure his life was better than it was yesterday. Fear motivates love – he continued to make sure people knew he loved them and that he was always there for them. He often said, “Love your life. Things could be a lot worse”. Fear motivates strength – despite his battle with cancer, he always pushed himself to be greater. Skylor wasn’t only an amazing son and a wonderful big brother, he was a talented artist who had a passion for graffiti art. But, his passion didn’t stop there. He was a proud member of the Olentangy Marching Band, an active member of the Delaware County AFJROTC, volunteering his time to recruit members and helping the community. He also volunteered as an Assistant Coach for OYAA Jr. Drill Team, as well as volunteered with Habitat For Humanity during spring break his junior and senior years. He had a calling and he lived his life fulfilling it. On October 30, 2016, Skylor lost his fight with cancer. During his battle, Skylor bravely and so gracefully provided hope, courage, strength, and love to so many. In honor of this wonderful young man who left us too soon, this race continues. Proceeds will be used to fund an annual scholarship to an Olentangy High School senior pursuing a college degree. A gifted graffiti artist and creative author, Skylor had hoped to attend college. We’re going to see to it that those dreams are passed on to many, many teenagers who follow in Skylor’s footsteps. Join us for the Inaugural Dot’s Tot’s Golf Outing at Thornapple Golf Course on Sunday, May 21, 2017. Register for the golf outing here. We have officially rescheduled our Inaugural Ladies Night Out event to Thursday, April 27, 2017. We hope you are available and interested in participating in April. 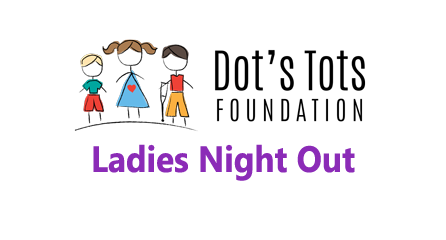 Dots Tots Foundation is proud to announce its Inaugural Ladies Night Out. 3. to provide support for teenagers in their higher education pursuits. Ladies Night Out will be an evening of camaraderie, fellowship, cocktails, hors d’oeuvres, a spring fashion show, and a spring makeup tutorial in benefit of a local charity. All proceeds will benefit Dots Tots Foundation. Buy tickets at the Ladies Night Out event page via Brown Paper Tickets. Mr. Tim Maurer and Mr. Sanito Mendoza of Mukha Custom Cosmetics & Medi-Spa. Mukha represents a revolution in the skin care and cosmetics industry. Downtown on High St, Mukha offers superior skin care products to clients who appreciate the importance of quality products designed to meet their individual needs. Internationally recognized make-up artist, Tim Maurer, has developed his own color and skin care line that is 100% mineral-based and is free of oil, alcohol, fragrance and talc. From facial cleansers, anti-aging serums, moisturizers, acne treatments, eye creams, and fragrances, every product has been developed to provide our clients with cutting edge ingredients to dramatically improve the appearance and texture of their skin. Jocelyn Miao, Fashion Consultant of Saks Fifth Avenue at Polaris Fashion Place Mall, who will dress our volunteer models in the latest spring fashion trends. Dr. Dana Winchester and the Winchester Institute of Chiropractic Health and Wellness are hosting this event. The Winchester Institute combines state-of-the-art technology with the timeless principles and proven results of Gonstead Chiropractic. Specializing in the Gonstead Technique, the Winchester Institute offers patients the foremost standard in hands on spinal adjusting. Gonstead Chiropractic has a single definition of purpose; locating and correcting vertebral subluxations for the improvement of nerve function. Grab your girlfriends and we’ll see you in April! Join Dot’s Tots Foundation for the Third Annual Holiday Party & Family Festival on December 10. Online ticket sales end at 5pm on December 9. Tickets will be on sale at the door, $20 for adults and $10 for kids (age 2 and over). Admission includes Magician, Face Painting, Balloon-Twister, Marshmallow Blaster, Santa Claus, and Dinner Buffet. A portion of each ticket purchased is tax deductible. Proceeds benefit Dot’s Tots Foundation’s general fund supporting area youth with debilitating disease, foster children and their families, and local teens in their higher educational pursuits. Paid RSVP required. UPDATE: We have reached capacity for this event and are now SOLD OUT! Thank you to all who registered. We look forward to seeing all who purchased tickets at the inaugural Old Hilliard Harbinger of Hope Restaurant Tour and Tasting on October 22nd! Ticket includes drink tickets, food, door prizes, T-shirt, and “swag.” A portion of each ticket purchased is tax deductible. Proceeds benefit Dot’s Tots Foundation’s general fund supporting area youth with debilitating disease, foster children and their families, and local teens in their higher educational pursuits. Door prizes include autographed Cincinnati Bengals gear, iPad, and more! Old Bag of Nails, Otie’s, and Local Cantina are participating. 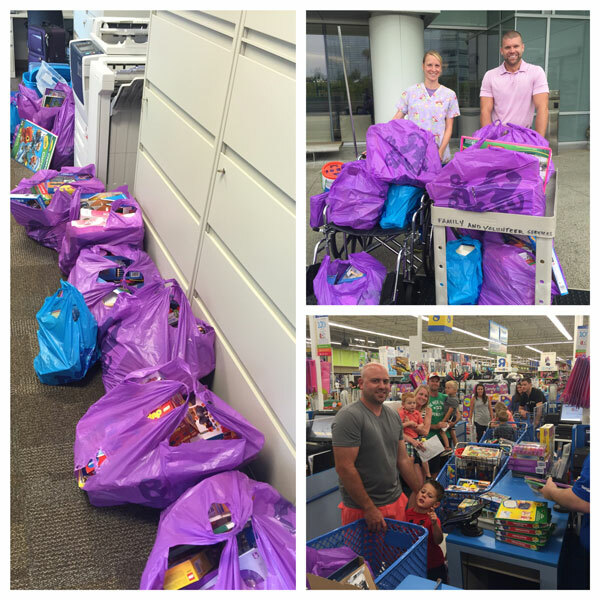 On July 7, 2016, Nationwide Children’s RN and Dot’s Tots Foundation Board Member, Libby Wenning, and Board Chairman, Andy Warnock, delivered $1,976.64 worth of support to the hospital. Connie Hieatt, Community Events Coordinator for Hematology and Oncology accepted the goods on behalf of the Children’s Hospital Fund. Thank you to all of the supporters of Dot’s Tots Foundation in making an impact on our youth who are in desperate need of joy and hope. Come support Crew SC as they take on the New York Red Bulls in an Eastern Conference Final Rematch on June 25th at 7:30 PM! $5 from each ticket purchased will be donated to Dots Tots and their fight againist pediatric brain cancer.